LONDON -- Ford said it will be hit twice by UK tariffs to be imposed in the event of a no-deal Brexit. 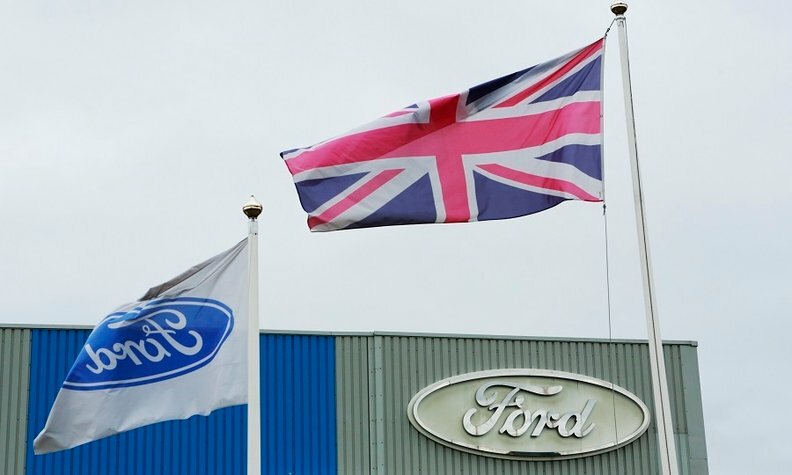 Ford, which makes engines in Britain, would be taxed on exporting them to assembly plants in mainland Europe and then face import duties for bringing finished vehicles back to the UK for sale. Rivals that build engines elsewhere and then ship them to the UK for assembly, by contrast, would incur no charges thanks to a tariff-free regime that Prime Minister Theresa May's government plans to offer for auto-component imports. And the same companies could then satisfy the demands of the local market direct from their British plants, also tariff free. The proposed levies were drawn up without detailed consultation with automakers, Ford said. Ford stopped making passenger cars in the UK in 2002 after seven decades of production, but still employs more than 10,000 people in the country, many of them at plants in Bridgend, Wales, and Dagenham, near London, that make engines for gasoline- and diesel-engine vehicles respectively. The company, which last month said a hard Brexit would be "catastrophic" for the UK auto industry and its own production facilities, also counts Britain as its biggest European market, representing 6 percent of global sales in 2017. The Ford Fiesta and Focus were the country's two best-selling models in the first two months, according to figures from the Society of Motor Manufacturers and Traders.